Here at Go Kart Kids we want to make sure the children have the most fun possible with the least amount of stress for the parents –that’s why we tailor the experience to suit you! 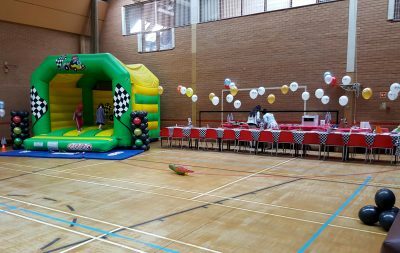 With 15 years experience at managing safe interactive birthday parties based mainly at our Loughton venue in Roding valley school sports hall but we also have other venues available or we can come to you, please contact us for further venue details. Bouncy Castle with every booking! Our standard entertainment party package is an hour and a half of the Go Karts or Quad Bikes or you can have a mix of both (age restrictions apply, please see below) and then half an hour for food. Although we can cater for up to 32 children, 24 is often best as then each team will enjoy 3 turns lasting 5 minutes – a total of 15 minutes driving for each child. For our Go Karts the age range is 4-10 years and the seats are fully adjustable to accommodate different sized children-there are also speed regulators so you won’t have to worry about the kids going too fast! For our Quad Bikes the age range is 6-12 and as a safety precaution the children must wear crash helmets at all times. We limit the amount of children to 24 for this activity as it requires some extra instruction. 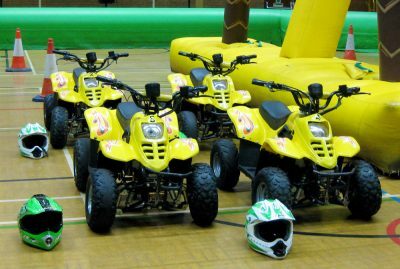 (Please note Quad Bikes are only available at our main Loughton venue). The cost of the party is £220 plus venue hire; it is £68 to hire Roding valley sports hall for the 2 hours, please contact us for other venue hire costs. 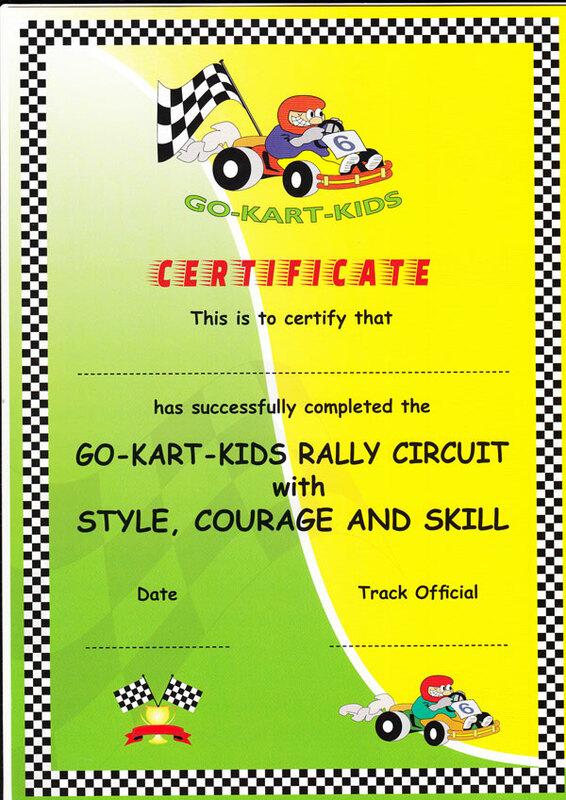 It’s always great fun and the parents can just sit back and relax as Go kart Kids organises and manages the party. 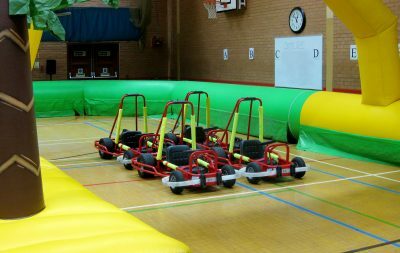 The inflatable circuit is the largest of its kind and has 4 electric Go karts or 4 electric Quad Bikes on the track at once while the other children are waiting their turn they are free to play on the complementary Bouncy castle. Just let us know at the time of booking which activity you want at your party and we’ll tailor it to you. To create a lively and fun atmosphere we play the latest chart music or music suitable for the age group but feel free to bring along your own playlist on an ipod and we can pop it on for you through our PA system. As a special treat to mark the birthday boy or girls big day, at the end of the session we have all the guests lined up around the track while the birthday child does their “birthday lap of honour”- driving around backwards while the other children cheer, clap and chant their name. The birthday child then gets presented with a trophy –it’s the perfect photo opportunity! All other children who attended are awarded a certificate for taking part. The final half an hour is spent eating your party food – it’s always fun for reflecting over the activities. You can either bring in your pre prepared buffet or arrange for pizzas or a takeaway to be delivered – either way, we will have all the chairs and tables set up ready for you.